OBEY. “Obey,” we’re told. I’m not being figurative. The Google hyperlink for the company Obey is titled “OBEY GIANT – WORLDWIDE PROPOGANDA DELIVERY.” Shepherd Fairey, the brand’s creator, has built an empire around the notion of “independently” distributed propaganda. Their messages volley from purposefully nonsensical to overtly generic to images blatantly juxtaposing warring ideals. And swaths of it(t-shirts, posters, accessories, etc.) 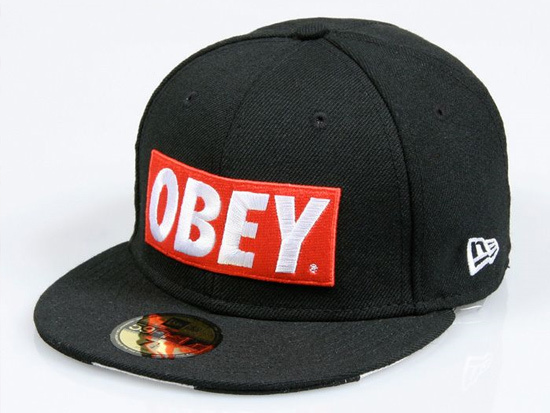 come branded with the company stamp in bold, capital lettering as their centerpiece: OBEY. It all beckons the question: “What is communicated?” Originating in the grunge and skate culture of the late-80’s and continuing through the 90’s, the counterculture’s creativity and apathy towards contemporary America garnered commercial success through mainstream popularity that continues into today. Street art flourished as one of the movement’s largest offshoots, graffiti and “vandalism art” becoming an accepted medium for self-expression. Skate counterculture’s origination within the underground, “low class” setting bolstered attraction through the indifference its artists showed to the mainstream, analogous to teenage angst and escapism. The art was created without concern for, and in response to, the “high-class” views and majority opinion that continually ignored and suppressed their voices. 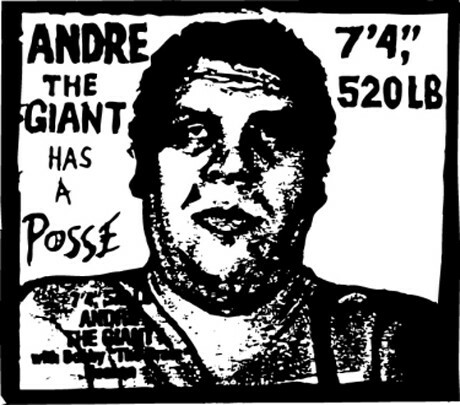 Through the “Andre the Giant Has a Posse” sticker campaign, Fairey elicited an unexpected response through his pseudo-propaganda, plastering the ambiguous image onto public property and facilities, addressing and involving the populace. The company website today states, “The sticker has no meaning but exists only to cause people to react, to contemplate and search for meaning in the sticker.” His creation was displayed, and in turn, seen as enigmatic without a meaning directly understandable by its audience. Presented as a hollow parallel, and commentary on government issued protocols and state-sponsored proliferation of American culture(i.e. capitalism, incessant advertising) the process instead encouraged governmental skepticism and imparted the essential need to “keep your eyes open, and keep your mind thinking.” The most important facet, though, was Fairey’s ability to distribute unmediated communication from one individual to his every peer in society, the “truth” or “validity” of the statement less important than its broad absorption by the people, and subsequently, by the culture. But Obey was not an isolated success story. As previously stated, it rose to popularity amidst a wave of competing countercultural hobbies turned careers, accentuated by leaders(ex: Fairey, Banksy, Harmonie Korine, Stephen “ESPO” Powers) and imitated by the masses. Skate culture’s maturation and movement into modernity mimics the progression and evolution of the 60’s counterculture. As John Storey states, “like all popular cultural initiatives under capitalism, it[60’s counterculture] faced three possible futures: marginalization, disappearance, or incorporation into the system’s profit-making concerns(Storey, 89).” The diminution of a brand with ideals to a brand focused on monetization is more evident with Obey than other cases because the company has become what it was created to oppose, mindless consumption of product and opinion. Whether the title “OBEY” was chosen to be tongue-in-cheek or to provide commentary on the majority’s guised understanding of American societal structure no longer matters; its evolution (through mass adoption of subjective, liberal opinion and corporatization) reverts the initial “clever” and self-aware sentiment of “obey” to a literal understanding of the word, and company. Rather than continuing to ask its customers to be personally conscious of the society and world they exist in, Obey instead advertises these ideals as paramount, while concurrently rewarding its consumers for doing the opposite, adopting the company’s opinion rather than manifesting their own. Or, in true hegemonic fashion, adopting a style without thought of its implications. Another sheep in the herd, appropriately adorned with fitted caps emblazoning “OBEY” in a bold red-box across our foreheads; no subtlety in telling the world what we’re best at.